Grafting and the Kitchener Stitch was the topic of the demonstration and discussion in my Lace Knitting sampler class this week. The story goes that the Kitchener Stitch is named after a British field marshal, Lord Kitchener of Khartoum, who, through the Red Cross, promoted the knitting of socks and other items for WWII soldiers. He requested socks constructed without a bulky seam or ridge at the toe which would cause discomfort to a soldier's feet. A sock pattern with a grafted toe was [supposedly] designed by and thus named after him. Whether true or not, it's a quaint little tale. 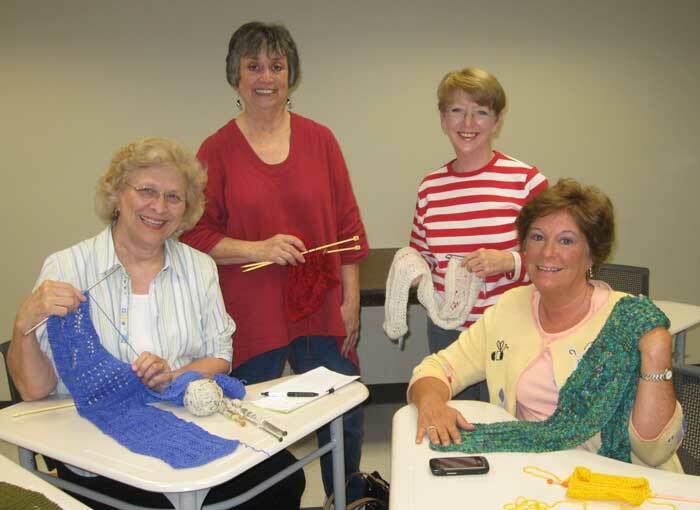 Lace Knitting students with their lace sampler scarves. What came out of the class discussion about this grafting technique, however, was an excellent question on the difference between grafting in stockinette vs. garter. I checked my copy of "The Knitting Answer Book ," and lo and behold, the information was there. There is a slight variation to the sequence of steps (and for reverse stockinette as well) among these patterns for an invisible join that blends with the surrounding pattern. For those familiar with the technique, here is a cheat sheet. Stockinette set-up: Purl front leave. Knit back leave. Sequence: Knit front drop. Purl front leave. Purl back drop. Knit back leave. Reverse Stockinette set-up: Knit front leave. Purl back leave. Sequence: Purl front drop. Knit front leave. Knit back drop. Purl back leave. Garter set-up: Purl front leave. Purl back leave. Sequence: Knit front drop. Purl front leave. Knit back drop. Purl back leave. So, whether it's socks, shoulders, or fingertips, here's a salute to Lord Kitchener for a seamless ending. Happy Knitting!